Typically, we don't think about illness offering us anything positive. But it can, and it does for countless numbers of people. After the initial stages of shock and grief, many people develop greater resilience and go on to what I call "flourish." Live in a way that makes their life even more satisfying, full and compelling than it was before. It has become my life's work, helping patients with diabetes flourish: develop better health, along with emotional strength, confidence and happiness, and live more appreciatively and construct lives of greater meaning and purpose. I also help health care professionals work with patients from an approach that fosters flourishing. When it comes to chronic illness, health care professionals focus almost solely on the medical issues, all but ignoring the person who lives with them. Medical students receive little, if any, training how to help people with chronic illness live -- exuberantly, healthfully and happily -- with chronic illness. Perhaps then it's not surprising that seven out of 10 deaths in the U.S. are caused by chronic illness. "Healing" is understood to pertain to acute injuries. Few health professionals think "healing" can also pertain to chronic illness. Yet it can; we heal a bit every time we are heard, seen and cared for. Oddly, even psychologists don't talk about healing in chronic illness, they talk about "coping." Yet coping implies negativity, that you are somehow deficient, struggling to come up to "normal." There is an opportunity in chronic illness that most providers are missing -- to help patients heal. How? By listening more and talking less. Praising more and scolding less. Looking for and acknowledging what we are doing well. Helping us discover our strengths. Inspiring confidence, providing support and holding a vision of our highest possibilities. This is what I teach. Nature gave me this beautiful demonstration of resilience recently. Over Christmas, I was walking on my friend's property in the Blue Mountains of Australia. Four months earlier, the mountain had endured the worst fire in 50 years. 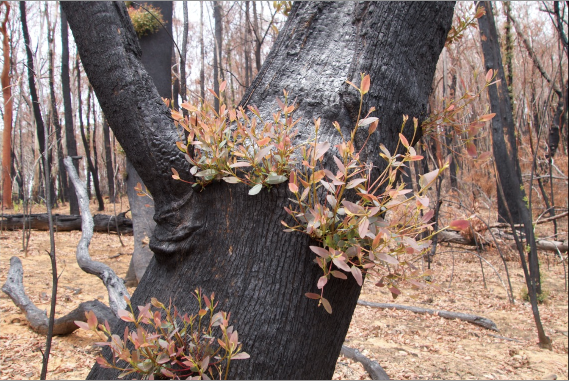 My friend lost hundreds of trees yet, remarkably, those still standing, while burnt and hollowed, were also sprouting new leaves, new life. Resilience is within each of us, as it is within nature. In the Harvard Business Reviews' "How Resilience Works," author Diane Coutu says resilient people possess three common characteristics: ability to accept reality, a deep belief that life is meaningful and an ability to improvise, to create solutions. Having interviewed more than 150 people living with diabetes, I've heard numerous stories of resilience and flourishing. Common among the stories are integrating the tasks of diabetes into one's life, seeing something positive in one's condition and using it as a catalyst to eat healthier, lose weight, get active and help others. Significantly, many people begin to live with more purpose after getting a chronic illness. The very thing that upends our lives in the first place causes us to realize what's important and become more grounded. Why is no one talking about post traumatic growth? While I've discovered many people create more satisfying, bigger and more vibrant lives after diagnosed with diabetes, the language of illness is dominantly "post traumatic stress" and rarely "post traumatic growth." Why? I believe a lot of it has to do with the fact that we live in a society focused on negativity. We are drawn to problems and problem-solving. It seems much harder to encourage hope, inspire confidence and envision possibilities. We are afraid to be happy for fear it will go away. We are afraid of seeming happier than others for fear they will ostracize us or shame us when our spirits falter. In the absence of training, tools and knowledge how to help people with chronic illness flourish, health professionals focus on solving tactical problems. In diabetes, you see it with the abundance of hardware to manage the disease -- ever-new and improved meters, pumps, pens, apps, medicines and mobile devices. You see little "heartware" -- empathy, collaboration, interest, attentive listening, support and praise. Yet as providers embrace these, they and patients' outcomes improve. I see the next leap in treating chronic illness as a shift in mindset and expanding skill sets for both patients and health professionals. If you have a chronic illness and feel you flourish, I'd love to know how you do that and what it's brought you? If you are a health care professional and work from a flourishing approach, I'd love to hear what you do with your patients and what you've discovered in doing it? Riva's latest book, Diabetes Dos & How-Tos, is available in print and Kindle, along with her other books, 50 Diabetes Myths That Can Ruin Your Life and the 50 Diabetes Truths That Can Save It and The ABCs Of Loving Yourself With Diabetes. Riva speaks to patients and health care providers about flourishing with diabetes. Visit her websites DiabetesStories.com and DiabetesbyDesign.com.